A plaque with LEE's new name now sits where the statue of Robert E. Lee used to stand in the school's lobby. 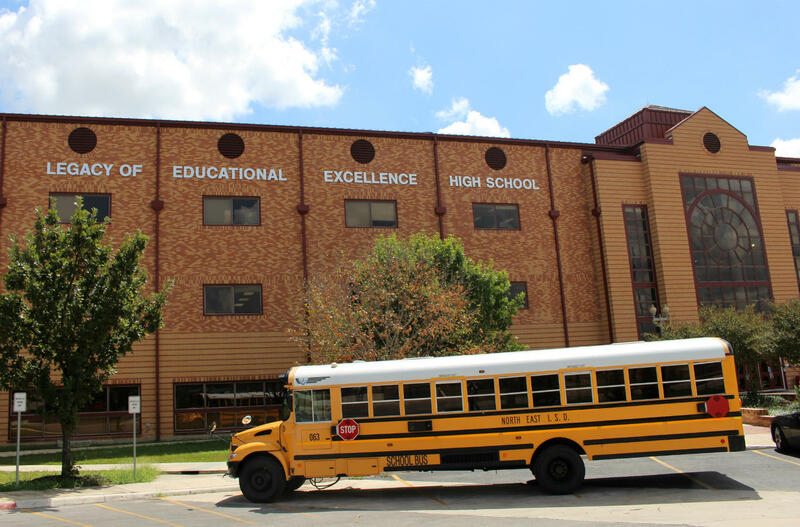 Despite vocal pushback from members of the school community, NEISD’s Robert E. Lee High School officially joined their ranks in August. 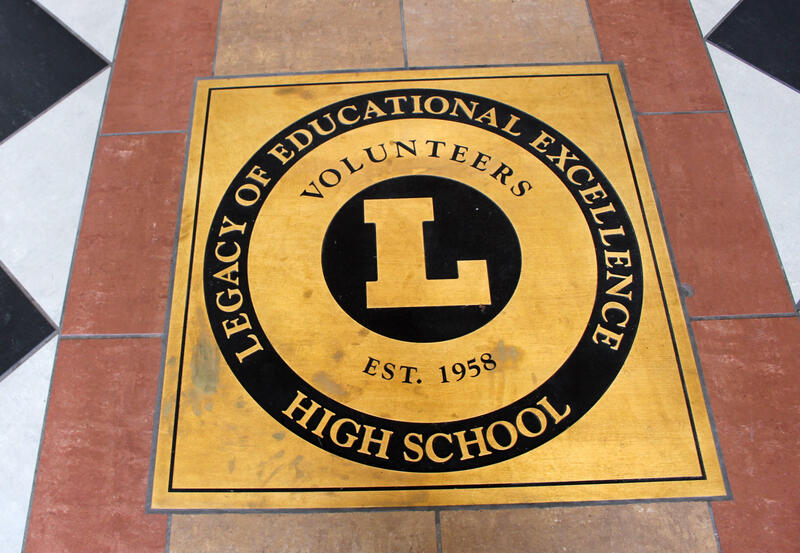 The LEE in LEE High School is now an acronym for Legacy of Educational Excellence, not Robert E. Lee. If the crowd at the football game is any indication, the school is still warming up to the idea. “For seniors, at least, that have been the original name, it’s put a little bit of a grey cloud over the senior year,” said Jessica Sanchez, as she watched her daughter practice with her dance team an hour before kickoff. LEE’s dance teams used to be called the Rebel Rousers and the Dixie Drillers, but now they’re the Royal Rubies and the Darling Drillers.In order to strip away any references to the Confederacy, it also changed the mascot, the fight song and retired some cheers. The dancers still wear their signature cowboy hats, sequins and fringe. But Sanchez said it’s just not the same. She doesn’t think the school needed to change its name. 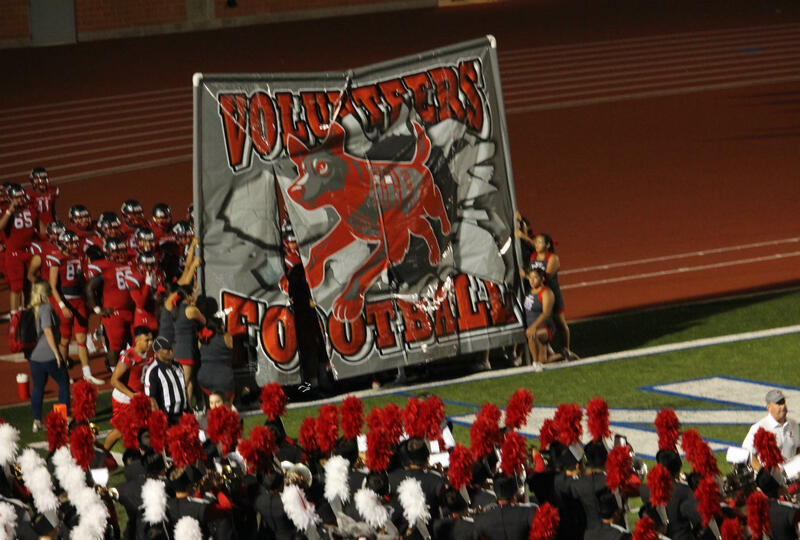 LEE High School's varsity football team breaks through a sign with their new military dog mascot at their first home game of the season. “It’s history. And history is history. We can’t change that. It had nothing to do with our era or any of these children,” Sanchez said. Like many schools across the country named after Confederate leaders, San Antonio’s Robert E. Lee High School was founded in the 1950s, shortly after the Supreme Court ruled that school segregation was unconstitutional. There are currently more than 130 schools named after Confederate soldiers. According to Education Week, roughly three dozen others have changed their names since 2015, after the Charleston church shooting brought renewed attention to Confederate symbols. As a senior at Lee High School last year, Kenny Strawn made changing the name his mission. “(Robert E. Lee) was a general that led a rebellion against the United States, and in no other countries on earth do you see them glorifying generals of armies that fought against them,” said Strawn, adding that the white supremacist rally at Robert E. Lee’s statue in Charlottesville last August convinced he and his friends it was time Lee’s name to be removed from their school. The letters on the front of LEE High School now say "Legacy of Educational Excellence" instead of Robert E. Lee. “It just didn’t seem like a place where everybody should feel safe should be named after somebody like that,” Strawn said. But at the football game, it was hard to find anyone that supported the name change. Watching her son play on the field below, Tiffany Laney said she didn’t have a problem with his school being called Robert E. Lee. “Personally I felt like the name change shouldn’t have even took place. I mean, the money could have went to better resources,” Laney said. Down in the student stands, where the mascot danced in their new costume, 10th grader Gaby Moncada said she’s not going to bother learning the new school song. 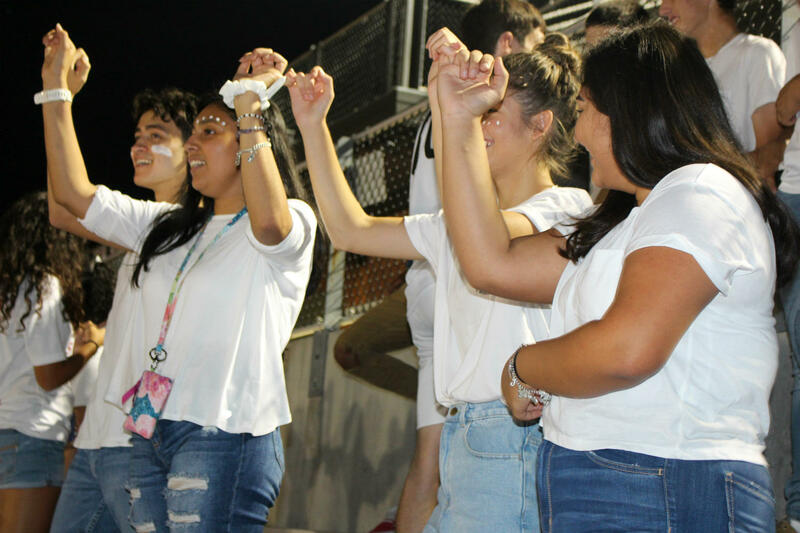 LEE High School 10th grader Gaby Moncada, right, holds hands with her friends during the final minutes of the football game Sept. 8. The mascot used to be a Confederate soldier named Grumpy Gus. Now it’s a military service dog. School officials say they spent about $300,000 replacing the mascot, removing the statue of Robert E. Lee in the school lobby and updating signs. They plan to move that statue and other Confederate-themed artifacts to the school library. Principal Nicole Franco said they implemented the effort over the summer to get a fresh start for the new school year. “We can’t afford the distractions. We have four short years with students and we gotta keep plugging along at what we’re here to do,” Franco said. District officials said it would have cost more than a million dollars if they hadn’t kept the name LEE and continued calling the athletics teams the Volunteers. But it also helped the school community accept the new name. 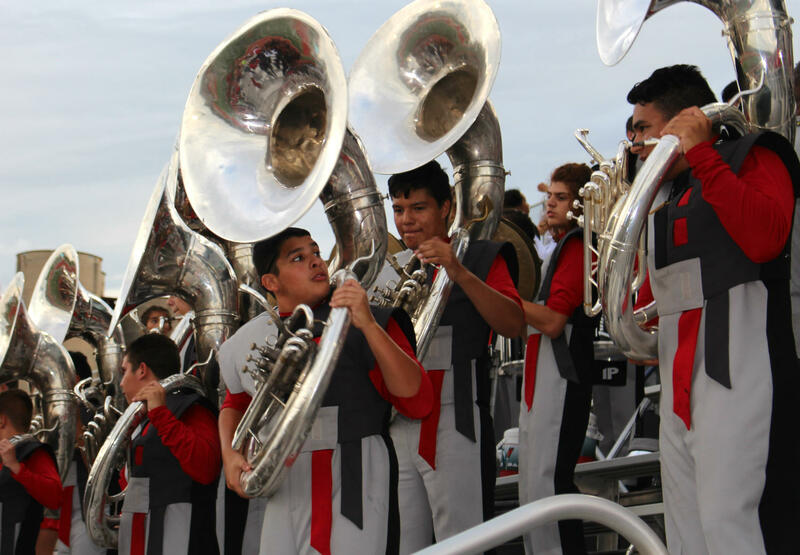 Deborah Guevara's grandson Rudy prepares to perform tricks with the rest of the sousaphone section during LEE High School's first home game of the season. Deborah Guevara, who went to Lee in the 80s, wasn’t happy about it at first. But sitting in the stands next to the band, watching her grandson Rudy perform, she said she’s mostly come around. “I look at him and I get all teary-eyed. … (He’s) very smart. He’s going to be our Texas A&M boy — in the band. I know it. I have no doubt,” Guevara said. And that, said Guevara, is why she’s fallen in love with the school all over again. North East Independent School District’s decision to remove the name of Confederate General Robert E. Lee from one of its high schools is again stirring controversy. A Facebook post promoting an online auction of items featuring the school’s old name and logo is drawing a strong reaction, especially from alumni who opposed the name change and don’t think the district should profit from it. TPR's Camille Phillips reports on the Lee High School auction. A new name for Robert E. Lee High School has been selected. Trustees for the North East Independent School District chose Legacy of Educational Excellence High School. Robert E. Lee High School will get a new name after the North East Independent School District Board of trustees voted to change it Tuesday night. A similar petition driven by students to rename the school failed two years ago. Several board members indicated recent violent events lead to re-opening the issue. The decision among the seven NEISD trustees was unanimous. Although school board President Shannon Grona did not favor a name change she says the Robert E. Lee name has become a lightning rod for hate and unrest. Northeast ISD voted Monday night not to change the name of Robert E. Lee High School. Since the racially-motivated mass shooting in South Carolina, institutions across the country have considered removing Confederate symbols. For NEISD, the emotional discussion has endured for months, with thousands of people for and against the change signing petitions and making public comments. One attendee of Monday’s school board meeting was Lee alumni Connie Strahan Stipp, who opposes changing the name of the school.